CAE Handbook Featured in Digital Engineering May 2018 | ESRD | Engineering Software Research and Development, Inc. In the May 2018 issue of Digital Engineering, contributing editor Tony Abbey profiled ESRD’s CAE Handbook as part of his “new series of overview articles looking at simulation and optimization software products.” Mr. Abbey then provides additional software product demos and commentary on his website, FETraining.net. Mr. Abbey reviewed two different CAE Handbook applications, the “3D Lug with Corner Crack” Handbook model from Fracture Mechanics library and a modified “T-Joint” Handbook model from the Parts library, the latter a collaboration between Mr. Abbey and ESRD. The CAE Handbook is a form of templating. An expert FEA user can set up a model with one or more parts using Linear, Modal, Buckling or Nonlinear StressCheck® solver solutions. 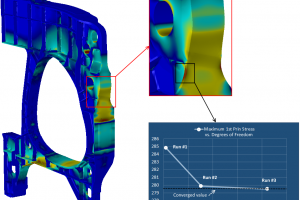 In the case of the cracked lug, the Contour Integral Method is used to predict the required Stress Intensity Factors. 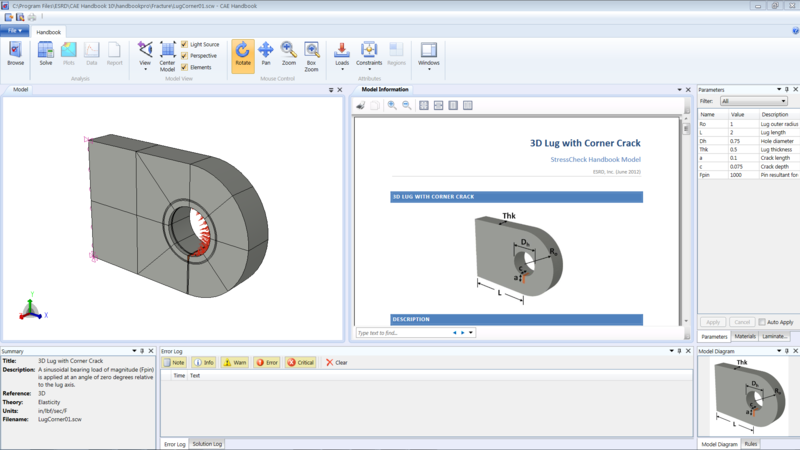 The Model Information window, Parameters window and all the other input windows can be set up by the expert, following the guidelines in the CAE Handbook author’s guide. This is ideal for companies with repetitive analysis requirements. In my case, some 40 years ago I had to carry out exhaustive lug damage tolerance analyses checks on the Tornado combat aircraft. A tool like this would have meant turning that work around far more quickly and delegating much of the analyses. In conclusion, the examples I used from the ESRD CAE Handbook library allowed me to investigate two different scenarios quickly. In the T-joint case, a useful extension beyond classical methods is found. Because I did not have to focus on FEA model setup, I could concentrate on planning the studies and interpreting the results. All models and documentation are loaded into the library, so it was easy to pick up the thread when I revisited the studies after a long break. 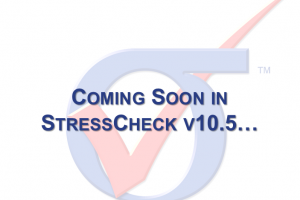 I look forward to trying the next stage, building up my own CAE Handbook example using StressCheck®. This past year, ESRD's Drs. 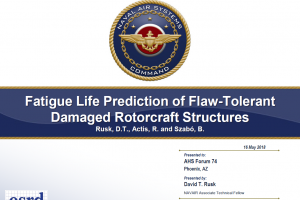 Barna Szabó and Ricardo Actis collaborated with NAVAIR's Mr. Dave Rusk on a technical paper titled "Fatigue Life Prediction of Flaw-Tolerant Damaged Rotorcraft Structures". This paper was presented at the American Helicopter Society Annual Forum 74 in Phoenix, Arizona May 14-17, 2018. Download the paper and presentation from our Resource Library!